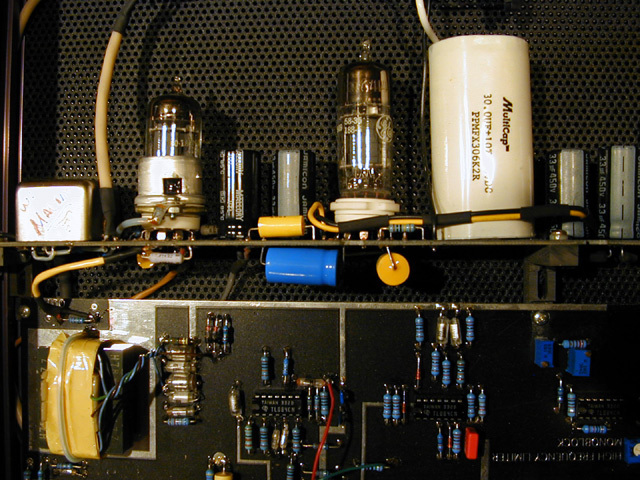 All Tube High Frequency (De-ess) Limiter — Manley Laboratories, Inc. The MANLEY HIGH FREQUENCY LIMITER works with entirely passive 3-component front-end circuitry sample-steered by a solid-state side-chain which energizes a "variable reactor" coil varying its "Q". The now-controlled programme is then amplified by an all-tube line amp with absolute sonic cleanliness. Selectable frequency ranges: 7 - 16KHz & 5 - 9KHz. Side-chain monitoring is provided to verify the frequencies being limited. The unit also features a "RE-ESS" capability to gently add back some top-extension after de-ess removal of irritating sibilants or other over-modulated high frequency programme content. NO the De-Esser section in the VOXBOX® is not anything like this one. The VOXBOX's De-Esser is exactly like our ELOP® limiter with a steep notch filter added so that the "ELOP" only works on the narrow band of frequencies you are trying to take out. It is narrower and faster than the old stand-alone unit that we used to build pictured here. Timing characteristics: think LA-2A with a notch filter. The Manley High Frequency Limiter was originally based on the same operating principle as found in the old Ortofon lathe cutting electronics de-Esser. If you are looking for something like that, then you will probably find the Manley High Frequency Limiter pretty similar in operation to that piece. Factory set for 100V, 120V or 220-240VAC operation for original destination country's mains voltage. Operating Mains Voltage changeable by replacing power transformer and changing fuse value. Mastering Version available with detented, logable BOOST & CUT control-switches precisely calibrated to 0.5 dB steps or as required.